BJ Winslow's Dapper Cadaver is now open Saturdays through the Halloween Season. Rental agreements and price sheets can be downloaded here. 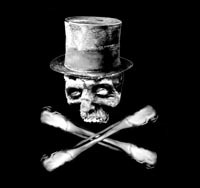 For purchases check out our retail site Dapper Cadaver. Decorate you Haunted House or Halloween Event with our Pro Props! Rentals, sales and custom fabrication are only the beginnings at BJWinslow.com . Our in store shelves are always stocked with a wide selection of bodies, parts, fetuses, torture instruments, autopsy props, specimen jars and more. We've provided props to thousands of productions, including hit shows like Bones, Dexter, and Law & Order, as well as major motion pictures like Pirates of the Carribean II, 300, Saw, and National Treasures. We've also provided props for a wide variety of direct to dvd horror, student films, independent cinema, magic shows, sideshows, halloween events, parties, photo studios, music videos, advertisments and gothic weddings. We've done prop hire in England, Austalia, and across the globe, including the Forensic Institute of the UK and Bollywood. Our Burbank shop is open to the public as well as prop masters and set decorators. The store front has been carefully arranged as half show room and half museum of madness, oddness and fun. The workshop is an area of constant inspiration and dedication, where unusual requests are our specialty. Let our expertise help you set the stage for the most authentic autopsies, culturally nuanced cemeteries, and realistic rot. Most props available for sale or rent. Sales available to be shipped worldwide, rentals can be shipped anywhere in the US or Canada. Email us your mailing address or click the Catalog link to download catalog and price list. Catalogs, price sheet, and rental agreements can be downloaded from the Downloads page. Rental is easy, and all that is required is a signed rental agreement and valid credit card. All prices quoted on this website are for week long rentals unless otherwise noted. Additional rental weeks cost 1/3rd the initial rental price. The majority of our inventory is available for purchase as well, and some of it can be bought online at www.dappercadaver.com. Bulk discounts are available on most items. All prop headstones and specimen jars are $150 for 10 pieces. Tombstones can be custom engraved with any name or message for $2 per letter. Contact BJ Winslow to place an order or to comission any custom prop. Welcome to BJ Winslow.com, Holly wood's premiere source for death related props, scientific equipment, oddities, and Halloween decor. BJ Winslow heads up a team of professional prop artists and art department crew with dozens of years of collective experience creating props, sets, and effects for film, television, stage, haunted houses, carnivals, and toy companies. BJ's resume of productions can be seen here, and photos of the productions he's worked on can be seen in the Art Department section. His specialty is all things death and science related, including headstones, corpses, blood, body parts, horror props, and more. His background includes education and experience in biology, veterinary, fine art, events, attractions, and commercial art. BJ's photography can be seen on Flickr, he maintains a Horror Business blog on Dapper Cadaver, and can be found on Myspace. BJ Winslow can also be contacted to set up and host sideshow exhibitions. Our exhibitions have drawn rave reviews at the Magic Castle, Freak Show Deluxe, Hocus Pocus, Haunted Village, Posessed Posessions, and many more. Oddity exhibitions are a great way to add something unique and memorable to any event. Exhibitions can either be traditonal carnival style, featuring chupacabras, feegee mermaids, pickled punks, torture instruments, and exotic artifacts, or exhibitions of Hollywood props.